Last Tuesday Google officially invited the media persons in New York event to showcase their products. Google launch many products but Pixel 3 phones, new tablet Pixel Slate and smart home device Google Home Slate caught more attention. This event showcased Google intentions, to diversify their business aside from strengthening its core business of advertisement. Google mastered data mining. Therefore, they know how to manipulate user’s data smartly for advertisement purpose. For that reason, Google understands the importance of investing in the mobile industry, as it will help Google to further enhance the core business of advertisement but at the same time it will help them to diversify the business. That is what we are experiencing with Google from the past few years, as they are focusing on widening the range of the product and service that are not related with their core business such as Access, Calico, Verily, CapitalG, GV, Nest and X. 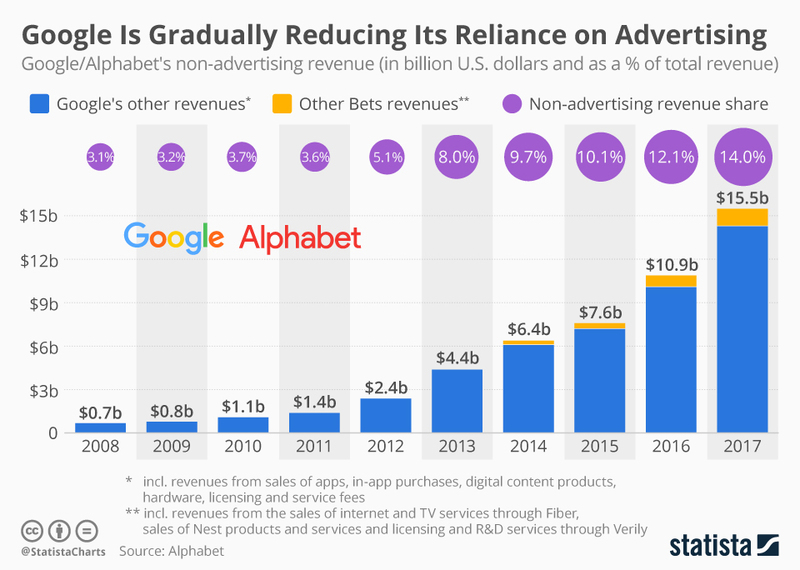 Furthermore, the following graph can explain you how Google investing trends in other businesses gradually decrease the reliance on Advertisement. It can be reflect from the following data, as in 2008 company earning from other than advertisement was 667 million that triggered to 15.5 billion dollar in just 10 years.